The holidays are here—and with them a fully booked calendar of work fêtes, impromptu festivities, date nights with your significant other and a myriad of other holiday duties. 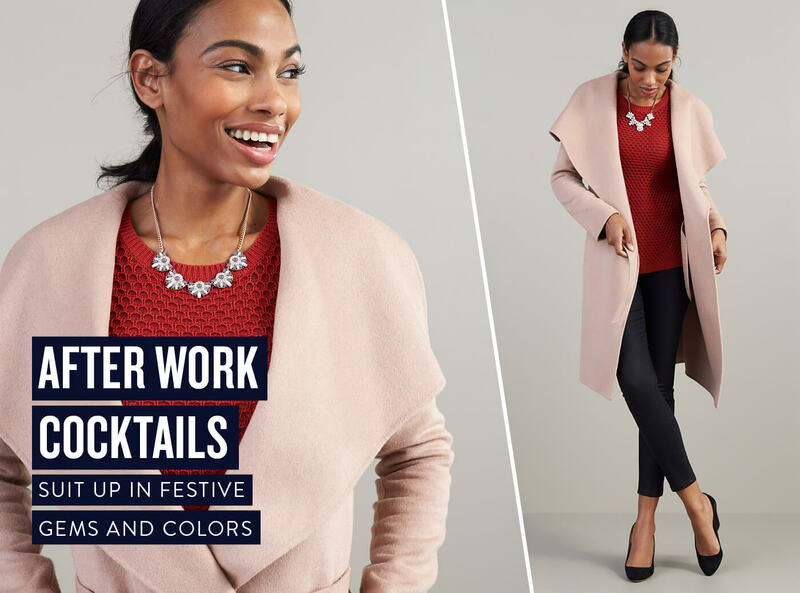 To get you in the holiday spirit here is our seven-day guide to Stitch Fix holiday style. 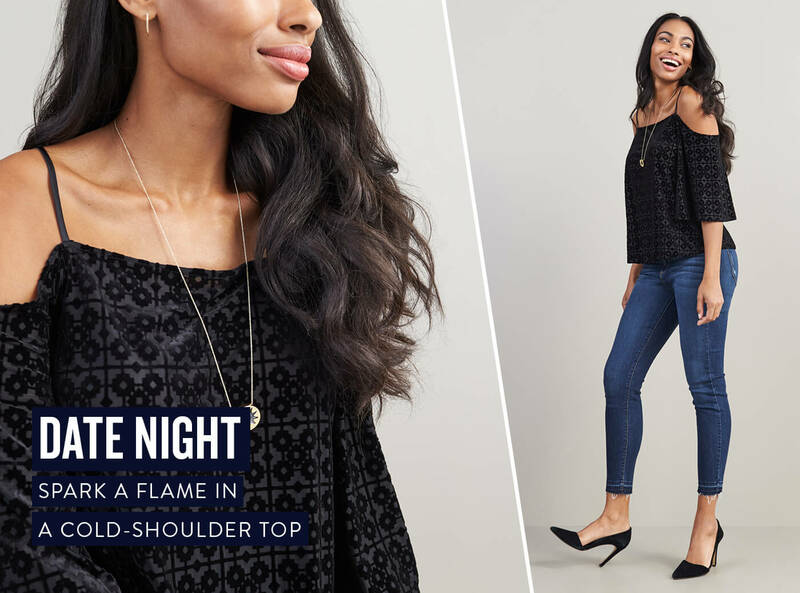 Keep scrolling to see the Stitch Fix guide to holiday dressing! Suit up in festive gems and colors. ‘Tis the season to break out winter palettes like rust orange, blush pink, and gem-tone hues to name just a few. Incorporate them into your workwear with a statement coat or a holiday-hued skirt. The ultimate office pro tip? Slide into happy hour with a secretly stashed statement necklace tucked away at your desk. Spark a flame in a cold-shoulder top. Even though the temperatures are dropping, add a little heat to your date-night look. Couple your cold-shoulder top with a pair of skinny jeans, then layer on a moto jacket for an edgy twist. More of a classic girl? Opt for a wrap or car coat instead. Add sparkle to your 9-to-5 with an embellished cami. 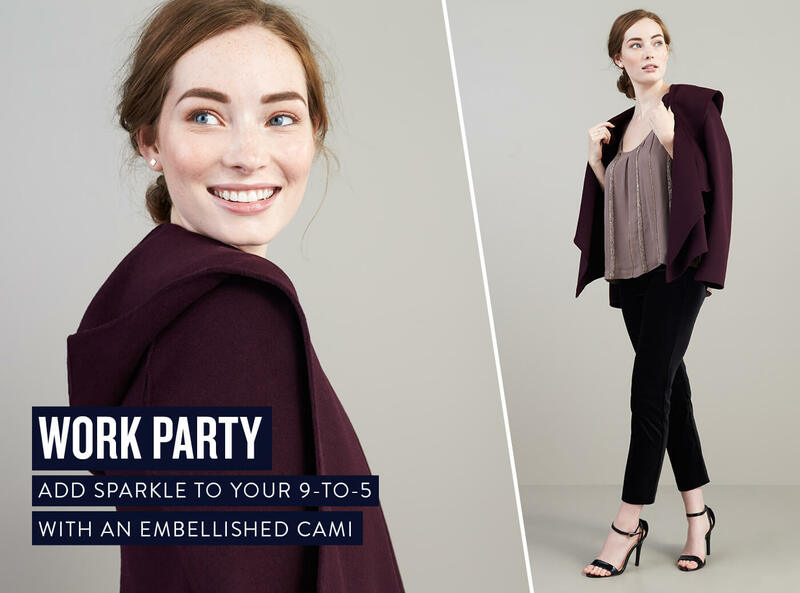 Sure, it’s not appropriate for your 9-to-5, but when it’s finally five o’clock somewhere, change into an embellished cami. Pair with a cropped wool coat and a pair of your favorite trousers or black corduroys—for texture and warmth. 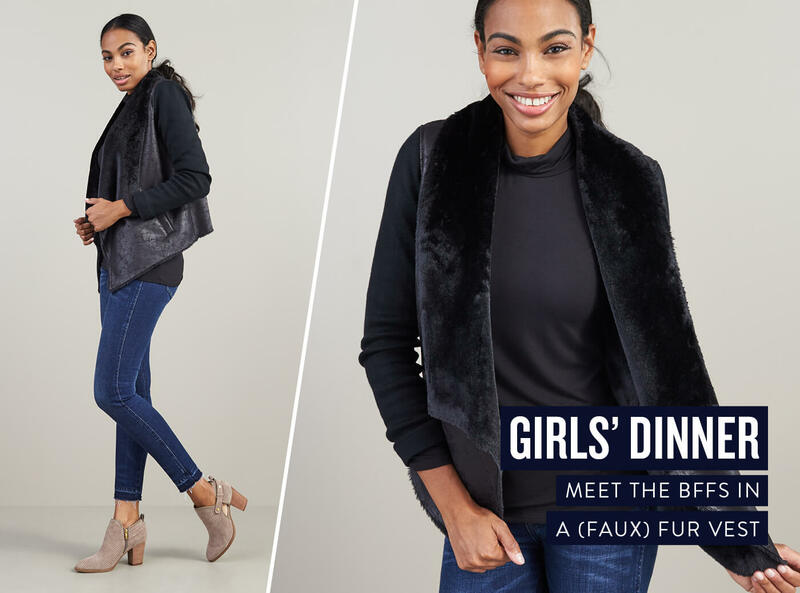 Meet the BFFs in a (faux) fur vest. Girls’ night out is the perfect time to eat, drink and be merry with your closest friends. Give yourself a style break (but don’t lose your street cred) in a casual ensemble that’s stylish, simple and easy to put together. Slip into your favorite skinnies and pair them with a sleek mock-neck turtleneck. 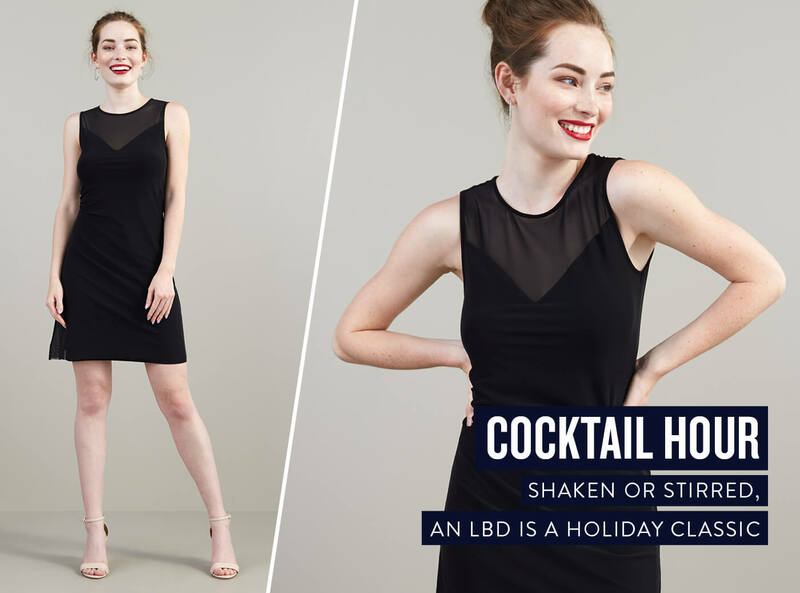 Shaken or stirred, an LBD is a holiday classic. When it comes to cocktail attire look no further than a classic, Hepburn-inspired LBD. To achieve this timeless look just follow these steps: 1) add a bold lip 2) don statement jewelry 3) wear your hair in a topknot (or if it’s short, wear it sleek!) and 4) add tights if it’s too cold to bear (legs). 5) Paint the town red. 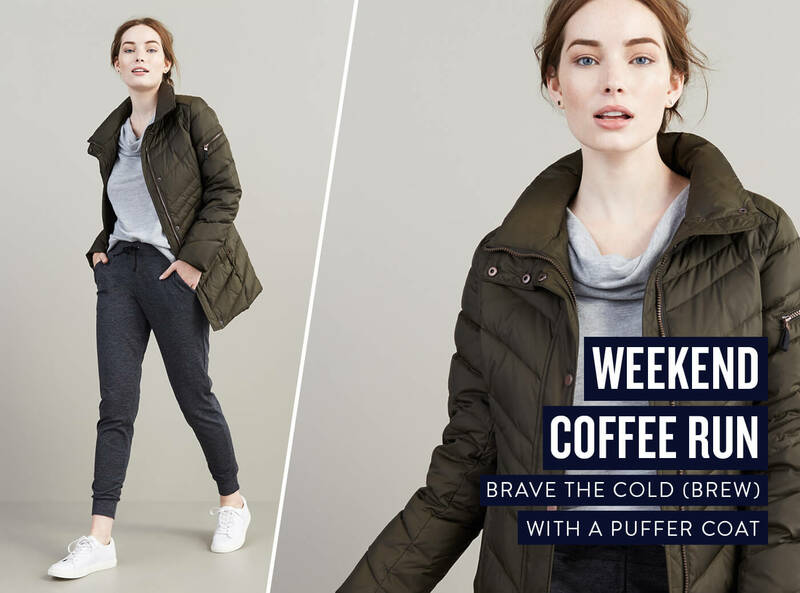 Brave the cold (brew) with a puffer coat. Grab your morning (or afternoon) pick-me-up in relaxed layers. Have at least one off-duty outfit on rotation so you can slip into comfort without having to give your look a second thought. Add a puffer coat to your chillest athleisure gear. Too cold for sneakers? Sub in a pair of ankle boots and extra thick socks. Set the barre high with a tulle skirt. Channel your inner principal dancer in a pastel tulle skirt and an oversized sweater. For shoes? Try a neutral pair of heels that are stylish and en pointe! Go full-on festive with embellished footwear—think pom-poms at the ankle or a gem-encrusted heel. Take a bow and exit stage left with your encore-worthy look. What’s on your holiday event radar? Be sure to pin your favorite looks and tell your Stylist in your next Fix note!